As Iranian President Mahmoud Ahmadinejad spoke at the United Nations, a large rally took place near the United Nations building. This participants were described as “Anti-Ahmadinejad protesters” (AFP), “anti-Iranian regime protesters” (CNN), merely “protesters” (NY Daily News, USA Today), “sponsored by groups including the Association of Iranian-Americans in New York & New Jersey” (CBSNewYork), and “a coalition of Iranian-American groups” (AP). Let me show you a few pictures. It may be subtle, but these are not actually pictures of an unaligned rally. I’m no expert, but it seems to me that when you spell out a message in giant mylar balloons, that’s probably the most important message of your rally. And that sea of yellow vests in the crowd? They don’t simply display “photos of people they say were massacred,” as the Associated Press and CBSNewYork report. 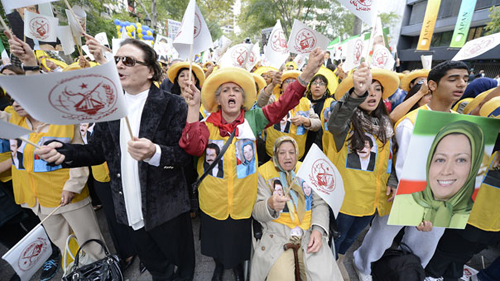 Each one has pictures of Massoud and Maryam Rajavi, the MEK leaders that have organized the group into what most observers call a cult. Maryam actually spoke to the rally from France, further showing the rally’s MEK affiliation. Several articles do mention that “protesters also praised the US government for its plan to remove an Iranian exile group called the People’s Mujahedeen of Iran, or MEK, from its list of organizations it deems to be terrorist groups.” What a coincidence. By first identifying the protesters as unaligned, these recognitions do more harm than good. They imply that the MEK has a broader support base than it does, and therefore also has greater legitimacy. This is, frankly, troubling. 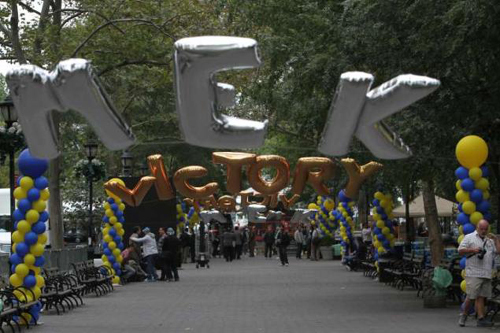 That a clearly MEK rally, with followers literally wearing the faces of the leaders of the organization on their chest, with giant shiny balloons saying “MEK” floating overtop, with MEK’s emblem floating in the background of almost every picture… That the news media reports this rally as being made up of “a coalition of Iranian-American groups” shows just how easy it could be for the newly unshackled MEK to muddy the public perception of the Iranian-American community.